Since it was officially Fall, Mr. LH and the "Pickles" decided it was a good weekend to camp in the back yard. They had enjoyed a backyard camp-out earlier in the year in their smaller tent, but this time The "Pickles" (with Daddy's help, of course) set up the big tent under a brilliant sky. Since we've had several backyard camp-outs in the past in North Carolina and at least one cub scout camping trip in the past, The Boy has become pretty good at setting up a tent. But The Girl was quite the little helper as well, taking her job as "tent stake pounder" quite seriously. Night temperatures have been dipping into the low 50's recently, but they announced the next morning that they slept soundly snuggled deep in their sleeping bags. One of these days we might actually leave home to go camping...but not too soon. I have a thing against finding bears in my campsite. The Girl and I usually walk to her school in the mornings. If we're having the unusual rainy morning, I'll drive her to school, but otherwise, even in the snow, we'll walk. ...though you do spot the occasional dandelion patch. The Girl does her part to keep the dandelion population thriving. There is even a small playground on the way to the school. The Girl will often run ahead of me so she has time for a quick swing or a trip down the slide before we continue on. This is a popular place for dog-walking and we've spotted several squirrels and even a pair of mallard ducks here. We would love to find a house that backs up to one of these beautiful, peaceful green ways. I love watching P. Allen Smith on Create TV (we don't have cable or satellite so Create TV is like my Food Network and HGTV rolled into one). When I saw the recipes he was making in this particular episode, I immediately ran for a notepad to write them down - Buttermilk Pecan Pie and Blackberry Jam Cake, both requiring buttermilk and both sounding delicious! Note: I searched the P. Allen Smith website for the Buttermilk Pecan Pie recipe but couldn't find it. I wrote the recipe down from the show just as it is written below. If you plan to make this, please see the notes following the recipe. 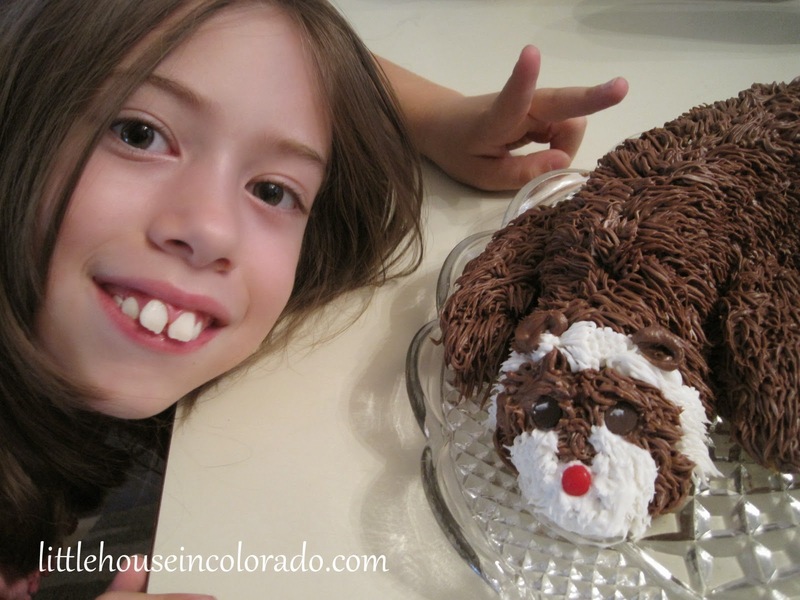 With an electric mixer or whisk, mix together butter, sugar, buttermilk and flour. Add eggs, vanilla and salt and continue to mix together. pour into prepared pie shell. Evenly sprinkle toasted pecans on top. Bake at 350 degrees for 50 minutes. P. Allen Smith just mentioned his pecans were toasted with corn syrup and sugar (he didn't specify what kind of sugar). He didn't give a recipe for it. I mixed about 1/4 cup of light corn syrup with approximately 3 Tbs of brown sugar, stirred in the pecans (before they were crushed), and spread the pecans on a foil lined cookie sheet. I placed them in the middle of a 275 degree oven for about 10-15 minutes. I didn't keep track of the time, but when I noticed the coating was a golden bubbly goo around the pecans and the smell of toasted nuts filled the kitchen, I removed them to cool completely. I placed them in a zip top bag and pounded them with a rolling pin before sprinkling them on the pie. P. Allen Smith is in Arkansas. I am in Colorado. I have never made a custard pie in Colorado so I don't know if the altitude affects them at all. After baking the pie for the specified 50 minutes, I noticed the middle was still pretty liquid-y. Even after letting the pie cool completely, the middle had not set. I re-heated the oven and baked it in 2 more 10 minute spurts (for a total baking time of 1 hr. 10 min.). This still did not help set the middle. The pie was cooked completely and it tasted fantastic (enough to make sure this pie is part of every Thanksgiving and Christmas dinner from now on), but I'm going to try this recipe again using an additional egg and/or more flour. I do want to note that the P. Allen Smith website, while missing the Buttermilk Pecan Pie recipe, has a Buttermilk Pie recipe that has a very similar filling but has even less flour. The softness of the middle was only a cosmetic issue and didn't stop us from eating every bite of this delicious pie! The Blackberry Jam Cake is next in line to be tried. I have to use up the rest of the buttermilk! 11/25/2011 Update: I made this recipe for Thanksgiving and added an additional egg and 1 Tbs. flour. I only needed to bake it for 60 minutes. The resulting pie was MUCH more solid and didn't seem to affect the taste at all. 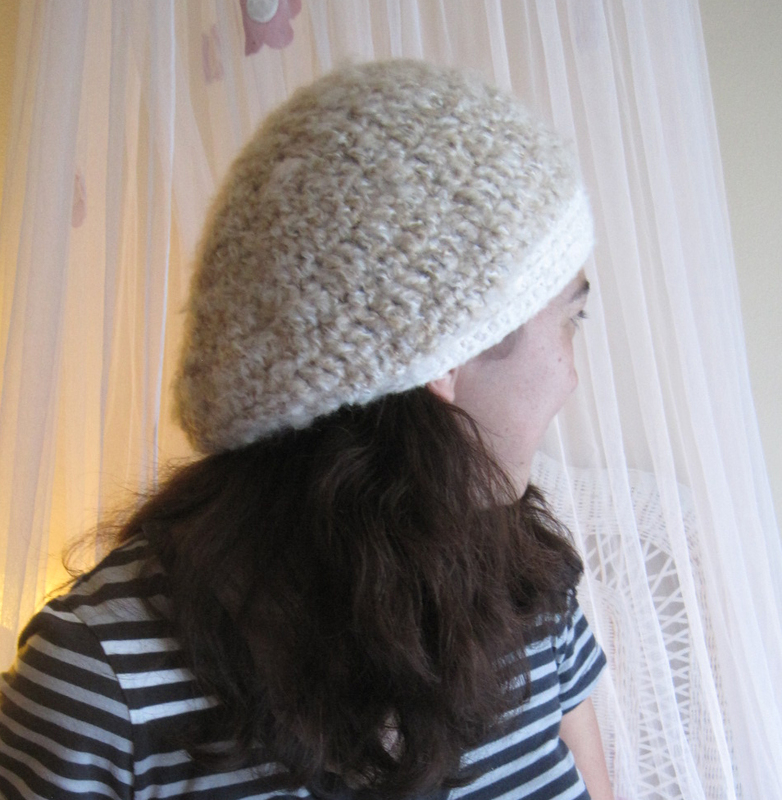 The top was a lot browner, though. Will said he didn't mind the goopy-ness of the first version. It was something to "sop up" with his pie crust but we agreed that if we were making it for others, we would definitely make the modified version if only to make the pie easier to serve. ...so all that was left were the dinner preparations. The "Pickles" both requested lasagna since the weather cooled down enough for us to use the oven without roasting everyone out of the house. The Girl wanted to open one birthday present early and I told her she could “just as soon as Daddy gets home”. Right about the time Mr. LH walked in, her neighborhood friends rang the doorbell and sang “Happy Birthday” to her. That meant hey got to be with her when she chose her early present. The Boy told her the smallest presents are usually the best but she’s still at the age where size matters – she chose the biggest present. 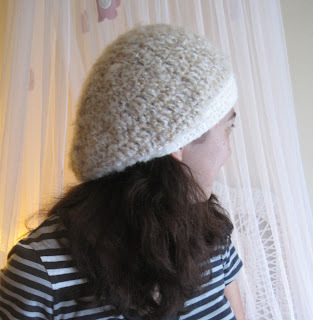 No matter, it was the ferret I had crocheted for her. And the smallest present? A pair of silver and lapis ferret earrings. The Boy was right...but then, so was she. Elder Boy and his girlfriend drove in from Fort Collins to help us celebrate. Though they couldn't make it in time for dinner, The Girl decided to wait for Elder Boy before she opened her presents and blew out her candles. 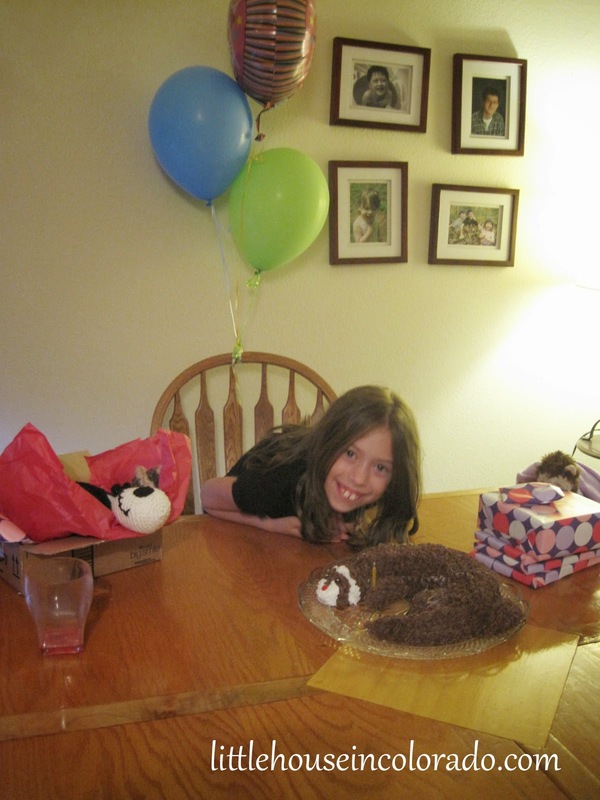 She also brought Coco (her Webkins ferret) and her new Jack Skellington to join in the festivities. 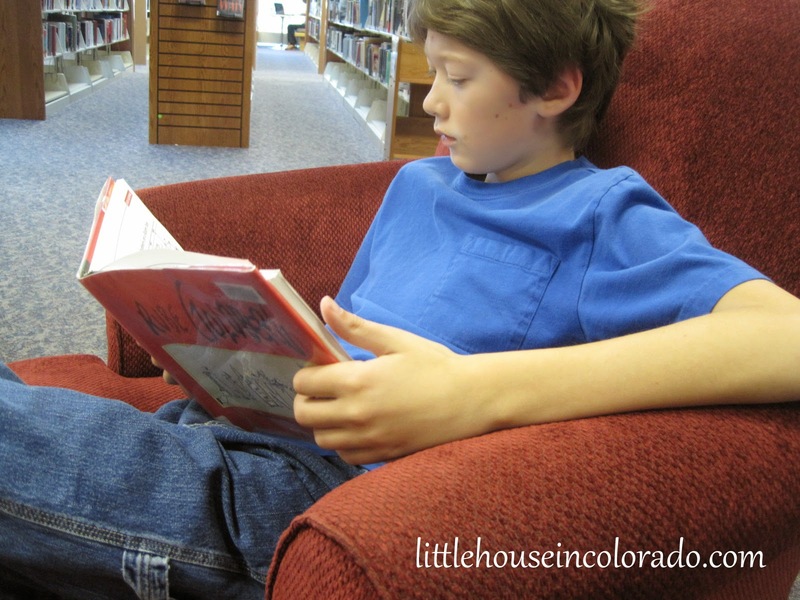 We had considered going to the park for a picnic on Saturday but wound up spending a good portion of the afternoon at the Aurora Central Library. It was the first visit there for the “Pickles”. The Girl found a book about Ferrets and another about other animals. I took The Boy to look for Rube Goldburg’s Inventions which he started reading right away. We did take advantage of the library's WiFi and sent out a couple emails informing people to call if they needed to reach us. … and Mr. LH read a book he had been meaning to get around to but never seemed to have the time for (he finished the whole book over the weekend). I called and had a long chat with my mom, too. Of course there were things that needed to be done online, but without internet access, we really had no choice but to wait. And that was fine. People had been notified of the situation and the phones were still working. The "Pickles" watched movies and played board games, cards and lego or ran around outside with their friends. The lack of internet service really didn't have an effect on them at all. However for Mr. LH and I, not being constantly connected to the outside world was, as he put it, "very liberating". By Monday afternoon, we had our new equipment delivered, installed and working properly. It was back to business as usual. 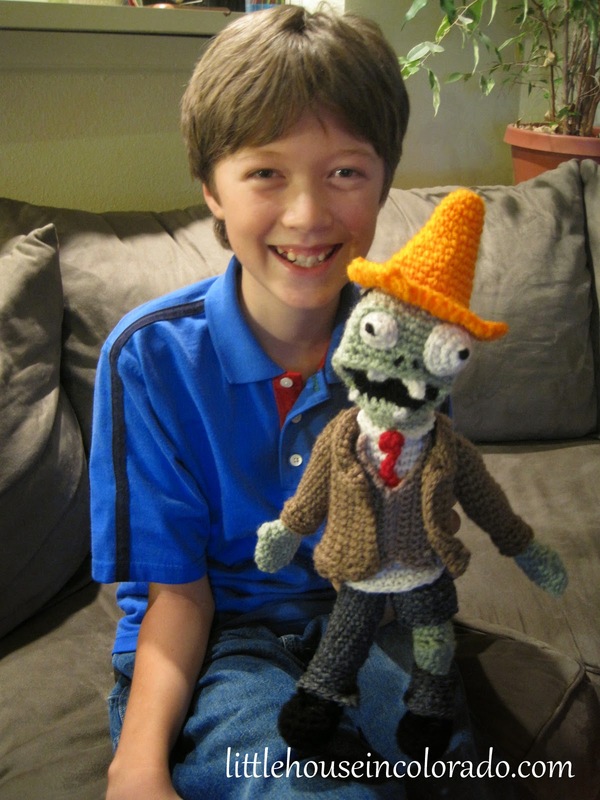 I mentioned previously The Boy’s request to make a “regular garden variety zombie” from his Nintendo DS game, Plants vs. Zombies. He wanted it "complete with the cone". They look like a happy bunch, don't they? 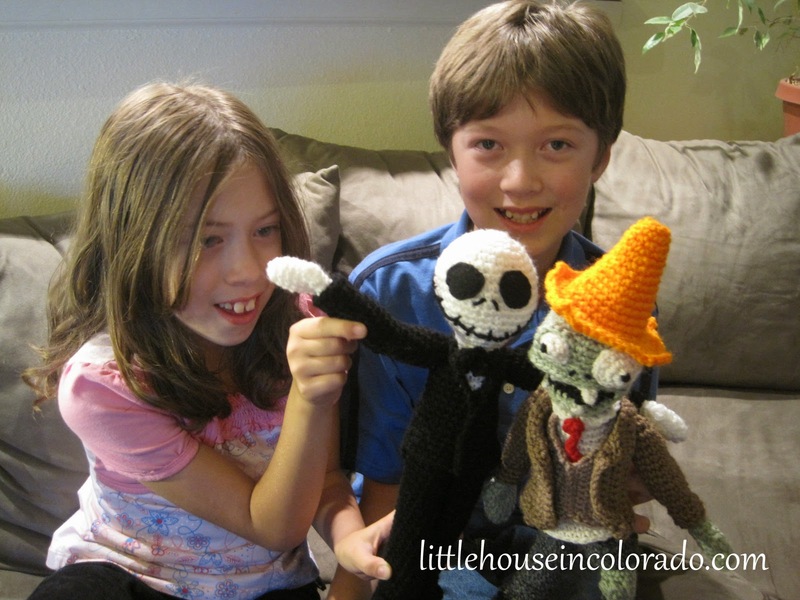 I started the zombie on September 5th, Labor Day (The Boy even helped me pick out the yarn colors) almost as soon as Jack Skellington was completed. By Tuesday, I had the head, face and torso finished (those were the hardest parts so I wanted to get the done as quickly as possible). My fingers were so cramped from the tight stitches that I switched to another project, a multi-colored 49 block Warm Up America afghan from Vanna’s Choice Color It Beautiful Afghans. 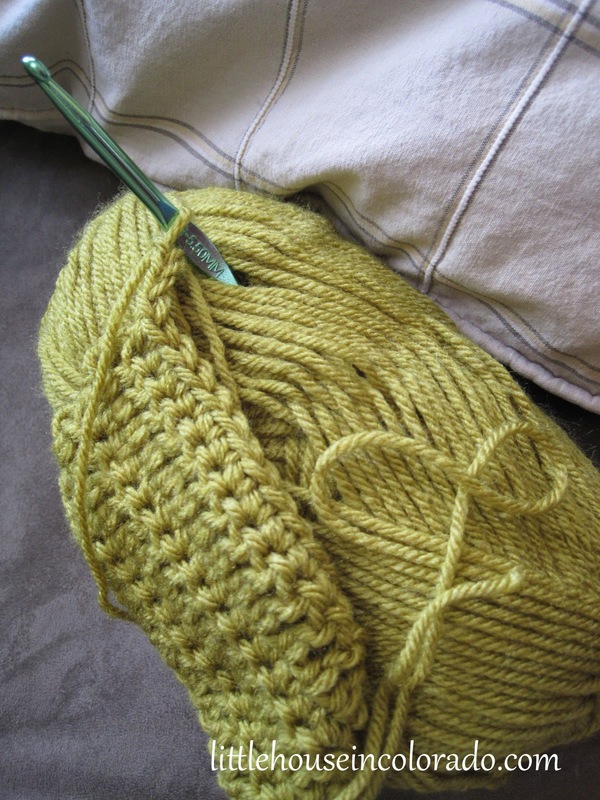 I had previously borrowed the book from the library and later used my 40% off coupon at Joann’s Fabrics to purchase it. 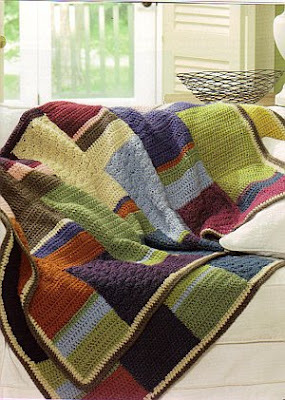 I fell in love with the photo of the Warm Up America afghan and knew I had to make it. 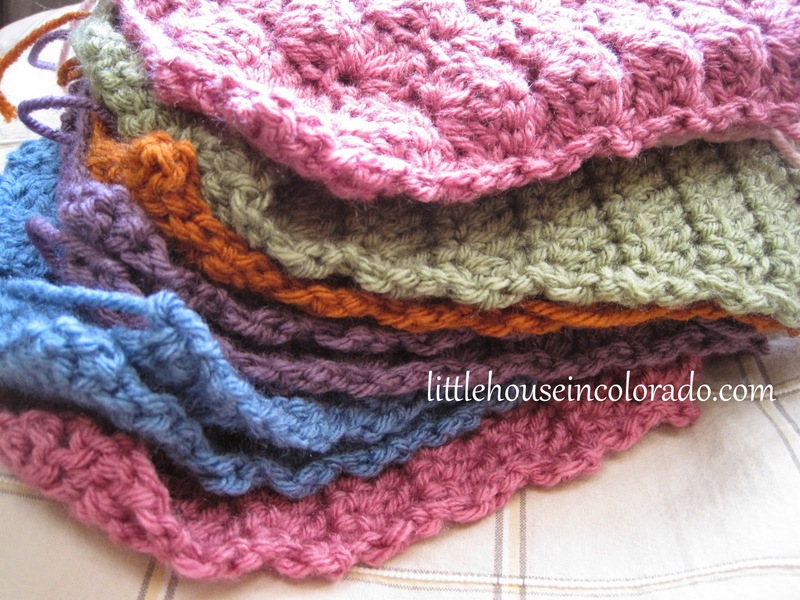 I told Will once that if I could make a washcloth (which was the ONLY thing I had ever crocheted up until a few weeks ago) then I could make an afghan. So I set out to prove it. I finished 8 of the 49 blocks that day and started back on the zombie Wednesday. The Boy would come home and find a new piece of the Zombie completed...a couple arms in place, one leg, etc. On Friday, I was done. He looks a bit happier than the zombie pack on the video game box. 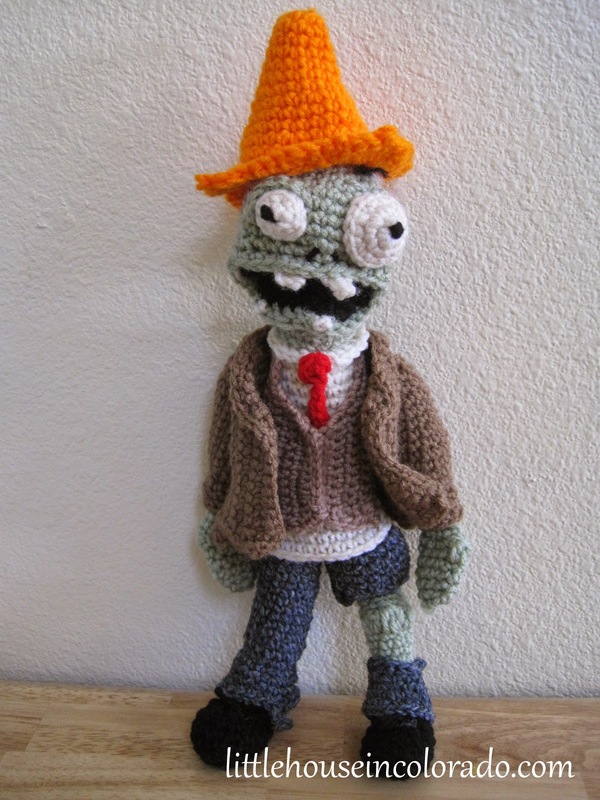 I even managed to fashion a crocheted cone for the zombie to wear on his head...as requested. The Boy was having a bad day from school but as soon as he walked in the door and saw his cone-topped zombie waiting for him (though a bit early for his birthday), his mood brightened tremendously. 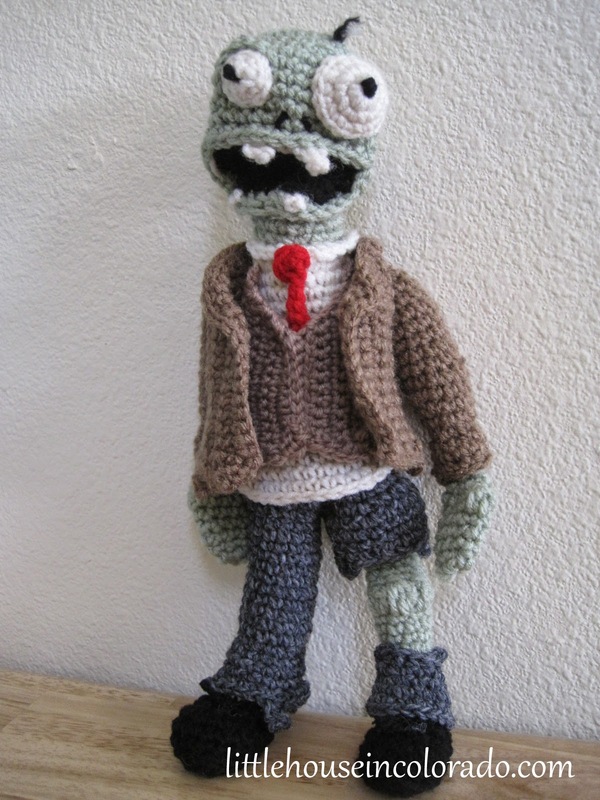 After completing several small amigurumi projects, The Boy said, “Since you’re so good at that, you can make me something for my birthday!” Then he produced his Nintendo DS game, Plants vs. Zombies. Heh. 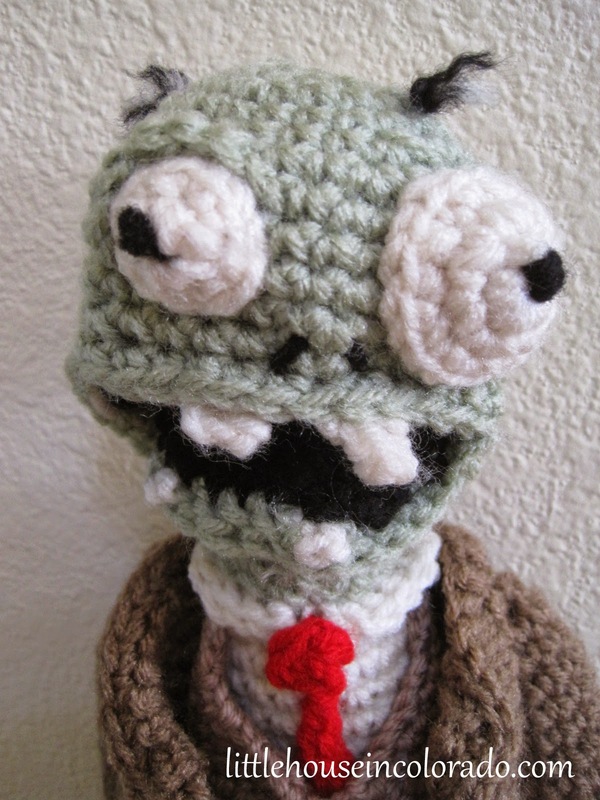 Well, I hand not yet tried to make the boy pattern in my Complete Idiot’s Guide To Amigurumi book, and I didn't have the right color green for zombie skin. But since The Boy’s birthday wasn't until December, I didn't worry about it. I DID have white and black yarn, so I pulled out that boy pattern and started modifying it to make Jack Skellington (from The Nightmare Before Christmas). I needed practice for the zombie, didn’t I? I didn't have to change too much. Since Jack is so tall, I lengthened the arms by 4 rows and the legs by 8 rows. I also used felt eyes instead of safety eyes and alternated black and white on the torso to create the “suit”. The Girl (who loves The Nightmare Before Christmas) was thrilled! I have been pretty slack in getting my oil changed since we move to Colorado. Part of the issue was not knowing where to go. There is a Grease Monkey half a mile from the house as well as another place right across from the street from them but I had never dealt with (or even heard of) these businesses. They were not the familiar businesses from North Carolina. I finally forced myself to go one morning to get my oil changed at Grease Monkey. I was able to be served immediately and the staff, mainly a gentleman named Mike, was very friendly. It had been so long since my last oil change that they came out to ask me how long it had been. The dipstick showed no oil at all! It did bring a smile to my face.